Samsung is ready to join the world’s largest furniture expo ― armed with home appliances, not smartphones ― to seek fresh profit sources amid the slowing growth of its smartphone sales. Samsung Electronics is scheduled to join the Milan Furniture Fair in Italy, which opens next Tuesday, to unveil its new smart home appliances including washing machines, televisions and refrigerators. Its CEO Yoon Boo-keun is also expected to attend the event. This is the first time for Samsung to display its home appliances at the fair, where the company generally showcased its smart technologies linked to its smartphones and tablets in past years. “Samsung may want to improve its profile in home appliances in the European market, where the company is better known for its Galaxy series,” said Kwon Sung-ryul, an analyst at Dongbu Securities. Its home appliances are still trailing European brands such as Miele and Siemens, which take up over 90 percent of the European furniture and appliances market. 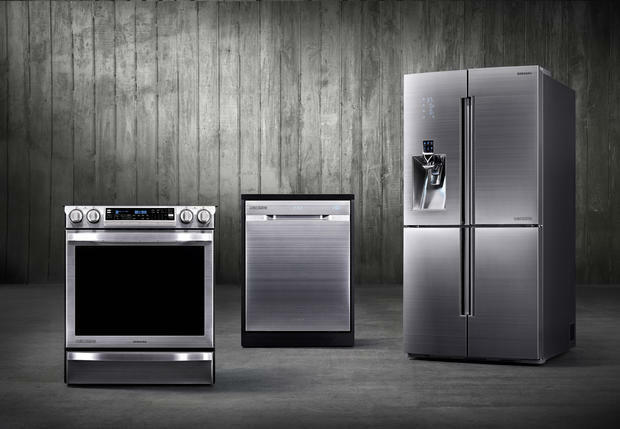 “Samsung is adding smart functions to its appliances to attract more consumers there,” Kwon added. At the fair next week, Samsung is expected to unveil its built-in home appliances and IT-based smart appliances such as refrigerators with touch screens and Internet-based smart TVs. The company will introduce its products in partnership with local brands. “We have developed drum washing machines and double-door refrigerators in collaboration with Italian furniture company B&B Italia, taking aim at European customers,” said a spokesperson for Samsung Electronics. “There are many good furniture designs that can be applied to electronics devices,” the company’s design center head Kim Hong-pyo added.